Over the last decade, North Dakota State has had unparallelled success, winning six of the last seven Football Championship Subdivision national titles, with a 28-2 record in the playoffs since 2010. 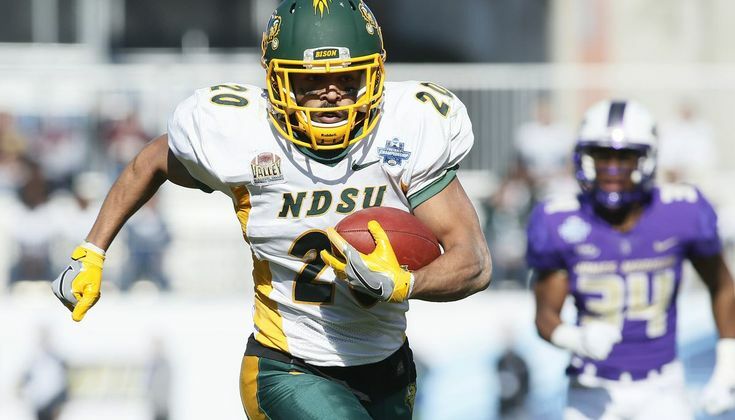 Throughout its dynasty, NDSU has been known for its downhill power running game and its reliance on the "Power O" run concept. Although the NDSU offense has been considered somewhat of a throwback in today’s world of RPOs, the Bison have done a great job borrowing innovative spread offense concepts that fit within their current system. A great example is their use of the power read play, which is blocked like a one-back power play, but offense reads the EMLOS (end-man on the line of scrimmage) rather than kicking them out. If the EMLOS stays tight to the PST (playside tackle), the quarterback gives the ball to the running back on a sweep path. If the EMLOS widens, the backfield action effectively blocks the EMLOS, and the QB pulls the ball and follows his pulling guard on the power play. From 2015-17, NDSU ran the power read 91 times for 848 yards (9.3-yard average) and four touchdowns. They ran the diamond power read 26 times for 265 yards (10.2-yard average) and one TD. • It&apos;s an unusual formation that defenses typically don’t see very often. 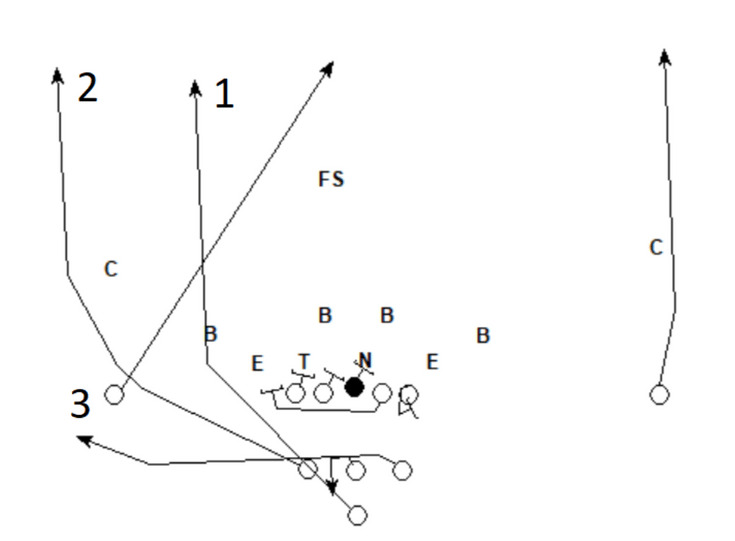 • The formation is balanced and allows for a diverse number of run schemes that can attack any gap. • By utilizing two lead blockers for the sweep, the offense can account for the alley defender and the playside linebacker. • In the event of a give, the offense brings three players from the box to the perimeter post-snap, which likely gives them a numbers advantage over the defense. 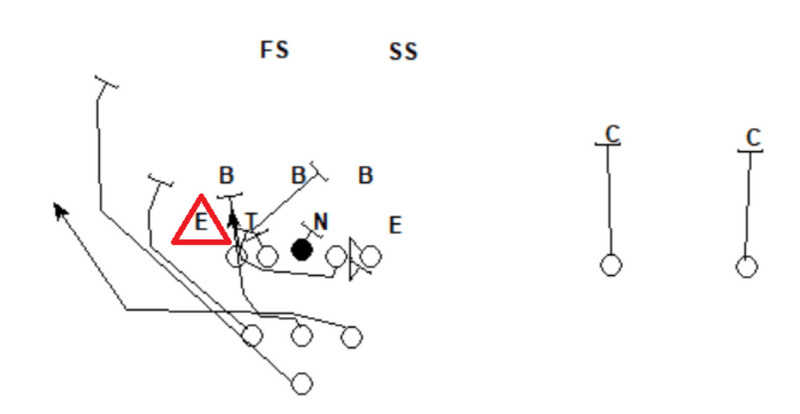 • Due to the balanced nature of the formation, they can bring all 3 backs to either side of the field post-snap. In order for the defense to counteract this and even the numbers, they must play very aggressively, which lends itself to some misdirection opportunities off this play. For the defense to counteract this and even the numbers, they must play very aggressively, which lends itself to some misdirection opportunities. The EMLOS stays tight to the PST’s down block, so the QB gives the ball to the backside back on the sweep path. The playside back takes a wide release to block the playside outside linebacker, and the pistol back seals the playside inside linebacker. 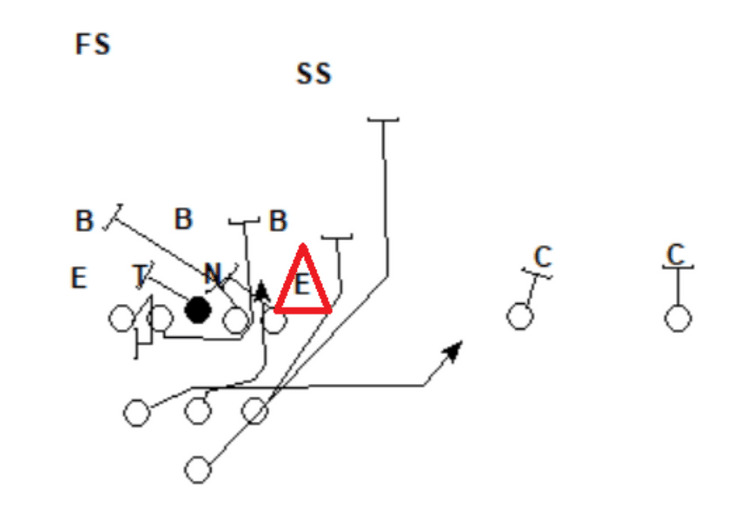 The free safety can&apos;t get to the perimeter in time, which gives the offense a 3-on-2 advantage in the alley. The playside back again takes a wide release to the playside outside linebacker. The pistol back looks to block the most dangerous defender inside the outside linebacker, which is the playside safety versus this look. 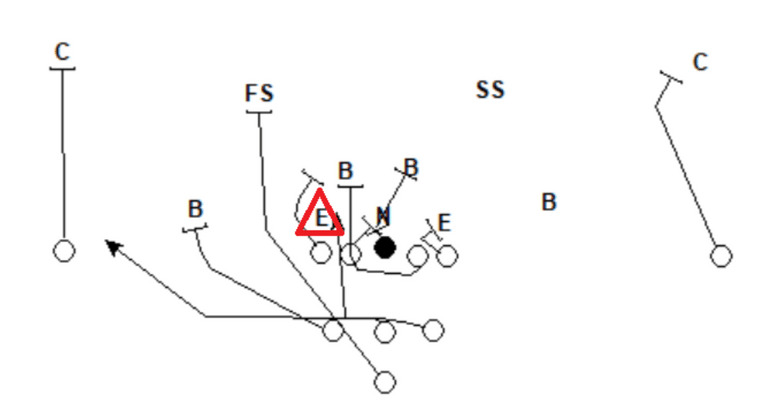 The playside linebacker stays tight to the box, so the PST continues to the third level to block the most dangerous defender. The EMLOS again stays tight, so the QB gives the ball to the backside back, and the offense is again able to gain a 3-on-2 advantage in the alley over the defense. 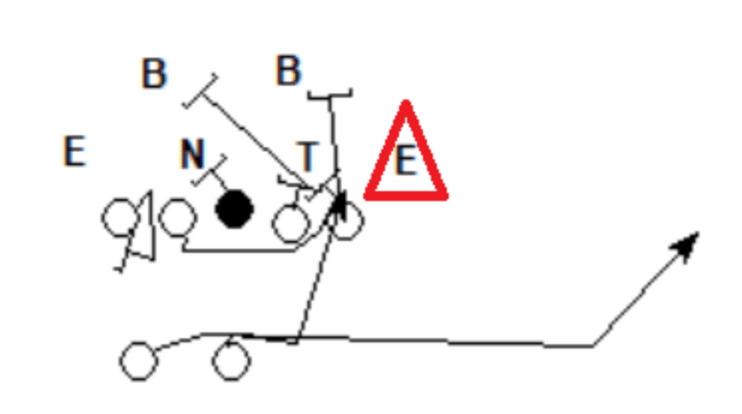 NDSU also has success with this concept from unbalanced formations. This gives an even more unique look to the defense, and usually leaves the offense with numbers to one side of the field. Ian Shields, the head coach at Jacksonville University, discussed the use of unbalanced formations similar to NDSU&apos;s at the 2018 NIKE COY Clinic in Portland, Oregon. Shields said they&apos;d look at the numbers, and if the defense didn’t react enough to the unbalanced formation, they&apos;d run to the overloaded side. If the defense matched the offense to the overloaded side, the offense then has the advantage running back to the nub side of the formation. When running to a two-receiver side, the receivers are responsible for the two defenders closest to the sideline, the two corners on this play. The playside linebacker flows hard to the alley, so the playside back takes him on, and the pistol back leads up to the third level and blocks the playside safety. The EMLOS again stays tight to the line, so the QB gives the ball to the back on the sweep path. Solid blocking on the perimeter again gives the offense the numbers edge in the alley. Because of the alignment of the defense, the offense knows it can gain a numbers advantage on the perimeter if the QB gets a give-read. The defense has no one aligned outside of the EMLOS, so they&apos;d have to scrape three defenders from the box to the perimeter post-snap to match the three offensive players. The EMLOS stays tight to the line, so the QB gives the ball to the back. The playside back takes on the playside linebacker, as he&apos;s the first defender to appear on the perimeter. The pistol back then continues to lead upfield before eventually taking on the free safety. Based on how the defense has aligned, there&apos;s no clear read-key for the quarterback. Because there&apos;s no unblocked defender in position to make a play on the QB, and because of all the defensive flow toward the perimeter, the QB keeps the ball. The pulling guard sees the blitzing linebacker and turns up early, rather than pulling all the way around the frontside double-team as he normally would. The backfield action helps pull five defenders away from the box, leaving a wide-open gap in the middle for the QB. There&apos;s also no secondary run support after the QB clears the second-level. Power read, especially from a three-back formation, is essentially option football, and the defense has to be disciplined with its responsibilities in order to have success. 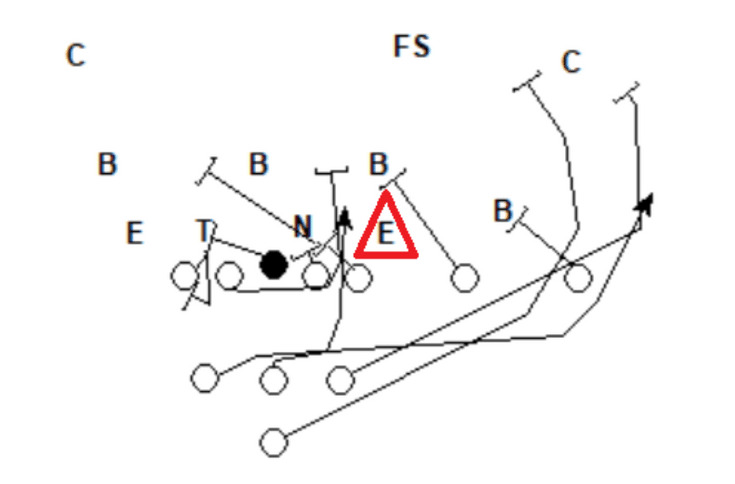 As this play shows, any mistakes can lead to wide-open gaps to run in for the offense. 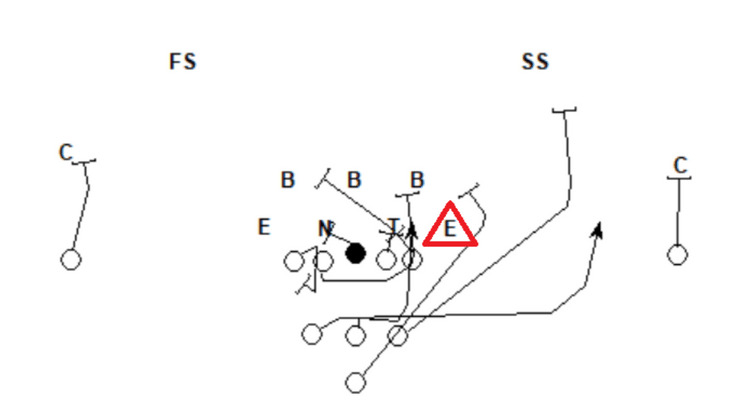 NDSU can also run power read with a crack tag from the receivers to give a different look on the perimeter. Whenever they utilize a crack block, NDSU tightens the split of their receivers, making it easier to get to their blocks in time. Both receivers crack block the first second-level defender to their inside. Because of the crack blocks, both backs lead around them, all the way to the outside. The playside back blocks the corner and the pistol back meets the safety in the alley. The offense is again able to execute their perimeter blocking, leading to another big perimeter run with the QB getting a give-read. The crack block is a nice change-up, especially if the offense expects to get a give read, and if the blocking angles work well versus the expected defensive alignment. Although they didn’t use this concept a ton, NDSU had tremendous success with play action off its diamond power read. The Bison ran this play six times and were 4-of-6 for 124 yards and three touchdowns, with one of the incompletions being a near-miss on a would-be score. The playside receiver runs in a straight line toward the goal post in an attempt to pull coverage. The playside back takes his normal wide release for his lead block and then wheel up the sideline. The pistol back runs up the seam and the backside back continues to the flat as the checkdown. The QB shuffles for a step as he rides the mesh, and then steps back and looks for: 1. Seam, 2. Wheel, 3. Swing. PST, PSG and C each steps down and protects their backside gap. The BST protects the backside C-gap and the BSG pulls to protect the frontside C-gap. As mentioned earlier, power read from the diamond formation can lend itself to some great misdirection plays, because of how hard the defense must flow to the perimeter. 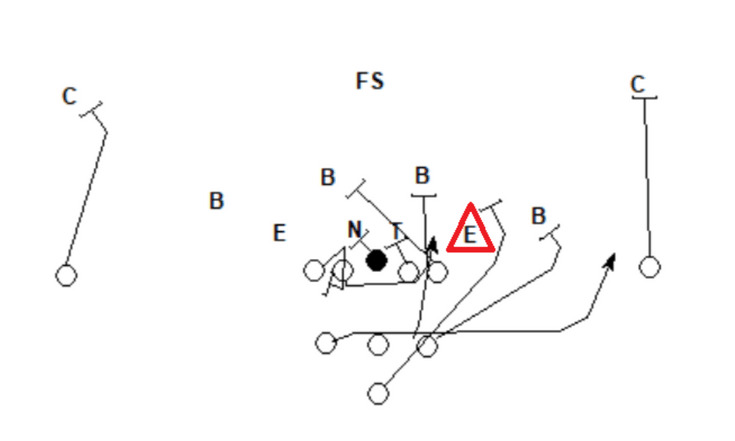 On this particular play, the frontside No. 1 receiver is usually able to pull at least one defender with him deep across the field. The backfield action will usually cause the second-level defenders to step up, which puts them out of position to run with the two vertical routes out of the backfield. Typically, the flat defender can carry one of the vertical routes, but the other one will likely be wide open. The protection scheme and the routes out of the backfield are still the same. The only difference is there&apos;s no frontside clear route now. The QB still reads seam to wheel to swing. 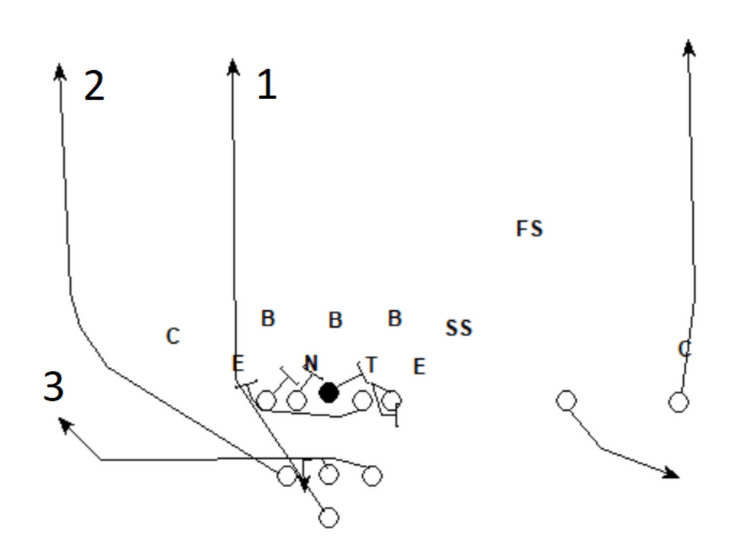 The advantage of running this concept from an unbalanced formation is that you can still maintain the same route integrity despite using a more run-heavy formation. Most teams, NDSU included, typically use unbalanced formations to give themselves better numbers and angles in the run game. 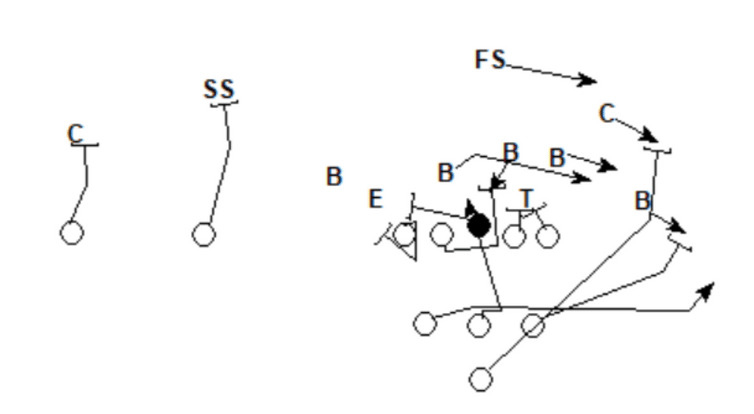 Both times NDSU ran this play, there was one defender in position to play a vertical route. Both times, the defender ran with the wheel, leaving the pistol back open up the seam. Power read and its complementary play-actions have been great concepts for NDSU over the last few years, especially from the diamond formation. Contact Taylor Kolste at TKolste20@my.whitworth.edu, or find him on Twitter @TaylorKolste. Check out more of his work at rileykolstefootball.com/. Want to see more content like this? Check out our Coaches Notes feature.